BEHIND ITS SHINY VENEER; PERSONAL STORIES SHAPE THE NEW UI STEAD FAMILY CHILDREN'S HOSPITAL. 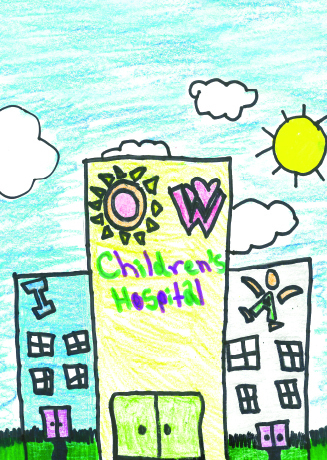 COURTESY OF UI STEAD FAMILY CHILDREN'S HOSPITAL During the planning process, dozens of patients sketched ideas for what they wanted in their new hospital. Tami Pollari still has the picture saved in her office. It's a wide tower, drawn by a wobbly young hand in bright marker, with long rows of windows and rainbow stripes. A helicopter swirls past, piloted by a tiny stick man pulling a tiny stick lever, no doubt on his way to save a tiny stick patient. Pollari, director of patient and family-centered services, thinks of that drawing whenever she looks up at University of Iowa Stead Family Children's Hospital, newly gleaming over the health care campus. Before architects drafted plans for the glassy, oval-shaped tower, patients seized crayons, markers, and colored pencils to sketch their own plans for the perfect place for healing. There's good reason why that young patient's rainbow creation is reflected in the facade of the new hospital, which is encircled by vertical, multi-colored light wells that illuminate the building at night. Pollari and her team didn't just pin the kids' pictures to a bulletin board and forget about them. Instead, they compiled a portfolio of the drawings for hospital leaders, architects, and committee members as inspiration in planning one of the most ambitious projects in the university's history. The project leaders noticed a common thread: the pictures didn't look all that much like hospitals. They had cats and dogs. Doorknobs and picture windows. Slides and swings. Flowers and sunshine. Simply put, they looked a lot like home. Today, the $360-million, 14-level tower is serving its first patients after officially opening its doors late last month. Connected to the main hospital and overlooking Kinnick Stadium, it's the realization of a longtime vision of a facility dedicated to pediatric medicine. 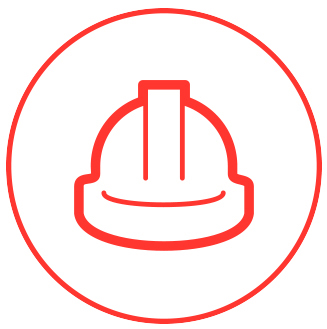 All told, more than 4,000 construction and craft workers labored on site, over 600 faculty and staff members conducted years of planning, and more than 11,000 donors from 50 states provided financial support. Just as crucial were the patients and families who collaborated to fill the hospital with thoughtful human touches that complement its advanced technology. Soothing respite areas like the rooftop garden and small conveniences like in-room refrigerators ensure the 507,000-square-foot hospital creates a sense of comfort and home—even when home is miles away and life is suddenly unfamiliar. "When we were having debates, it was so great to see people in the room look to the parents and ask them, 'What do you think?'" says Pollari, 81BSN, 01MSN, 01MBA, who coordinates the hospital's family and youth advisory councils. "That open ear is definitely reflected in the building." PHOTO, LEFT: TIM SCHOON/UNIVERSITY OF IOWA/OFFICE OF STRATEGIC COMMUNICATION; PHOTO, RIGHT: COURTESY OF UI STEAD FAMILY CHILDREN'S HOSPITAL Colorful art pieces add a touch of whimsy and cheer. COURTESY OF UI STEAD FAMILY CHILDREN'S HOSPITAL Drew's Lamp provides comforting light in patient rooms. A mong these contributors was a patient named Drew Wall, who ensured the new hospital was infused with a little bit of magic. On the wall opposite of the bed in each inpatient room hangs a bank of seven glowing cubes known as Drew's Lamp. 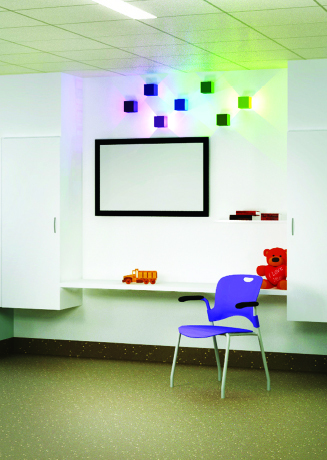 Adjustable by remote control or touchscreen, patients are able to swap the colors of the LCD-lit cubes to suit their mood, or make them pulse from one color to the next. In 2008, doctors diagnosed 11-year-old Drew with a form of bone cancer called osteosarcoma. In the ensuing years, he endured round after round of chemotherapy and radiation, as well as nine long surgeries, including a partial leg amputation. Each time Drew was hospitalized, he would pack—among other reminders of his Cedar Rapids home—his desk lamp. A straight-A student who played on his high school golf team with a prosthetic leg, Drew took pride in his school work, keeping his mind engaged even as his body failed him. Although his doctors needed the bright overhead lights to work, and his nurses could draw his blood in virtual darkness in the night, Drew preferred to study under the familiar, comforting glow of his lamp. When Drew was asked to serve on the youth advisory council during the early stages of planning for a new hospital, he pitched the idea of putting a kid-friendly lamp in each room. Wall died in 2012 at age 16, just as the construction crews broke ground. His vision, though, burns bright inside the new tower. Drew's Lamp gives rooms a soft and calming ambience in contrast to the typically harsh lighting found in hospitals. It also provides patients with a small sense of control during a time when many can feel helpless. "He was such a light to so many people," says his mother, Robin Wall. "It's great to have other families know his story and how he wanted things to be better for kids. He would think this is really cool." of the 28 construction contracts issued by the UI for this project went to Iowa-based companies. "That keeps dollars here locally, and there's a lot of pride in working on the project because it's here in their backyard," says Jason Miller, 05BA, director of project management for UI Hospitals and Clinics. pediatric patients served annually, 92 percent are from Iowa. is the force of a tornado the exterior windows are designed to withstand. "EVEN THOUGH THERE WON'T BE TRICYCLES IN THIS BUILDING, I'M EXCITED THERE WILL BE FUN THINGS ANY KID CAN DO, LIKE WATCHING THE HAWKEYES FROM THE 12TH FLOOR." Hospital patient Berne Denison, 11. COURTESY OF UI STEAD FAMILY CHILDREN'S HOSPITAL Private NICU rooms are 360 square feet—more than three times larger than previous bays. 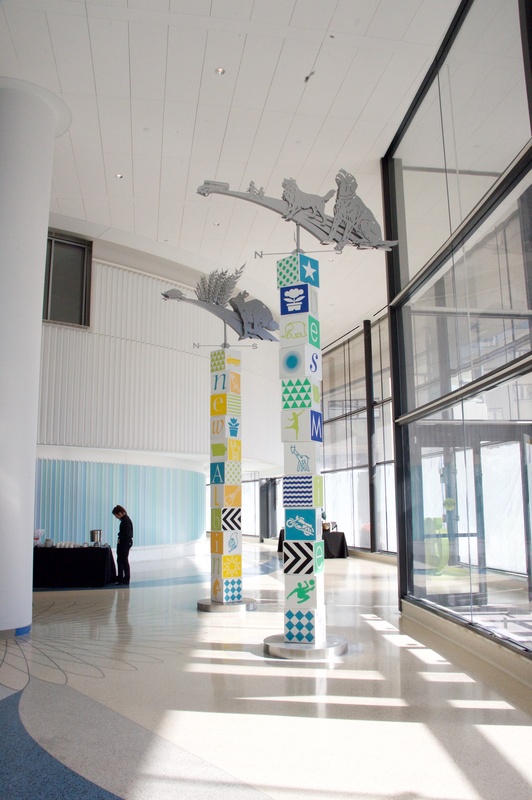 COURTESY OF UI STEAD FAMILY CHILDREN'S HOSPITAL These towers in the light-flooded Gerdin Family Lobby resemble stacks of alphabet blocks topped with wind vanes, yet another artistic nod to Iowa's heritage. Last November, with construction nearing completion, hundreds of curious visitors filled the Gerdin Family Lobby for a dedication ceremony and open house. Among them were 11-year-olds Berne and Maren Denison, who were born with cystic fibrosis and spent much of their early years at the children's hospital. Their parents, Chris Denison and Stacy Van Gorp, 12PhD, of Cedar Falls, also served on the family advisory council. The twins achieved some of their earliest milestones inside the old children's hospital. When Berne was a toddler, his doctor wanted him to get exercise during his treatment, so he learned to ride a tricycle up and down the hallways. "Even though there won't be tricycles in this building, I'm excited there will be fun things any kid can do, like watching the Hawkeyes from the 12th floor," Berne said during the dedication ceremony before he and other patients cut the ribbon. 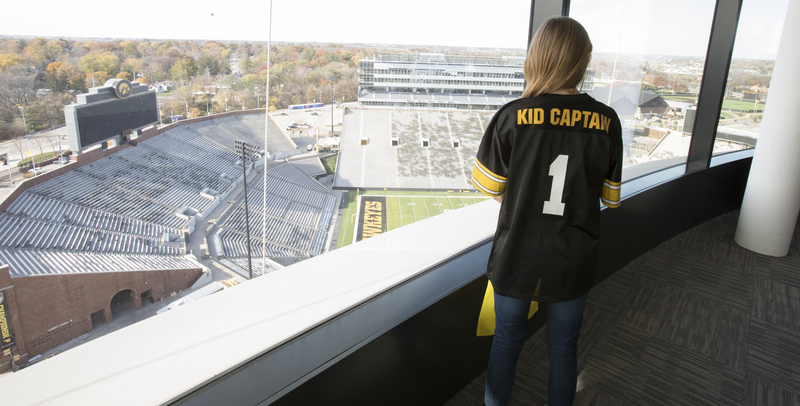 That top-floor Press Box—a scenic space overlooking Kinnick Stadium—is among the many areas throughout the hospital designed to uplift patients. Elsewhere, kids can get cozy with a book in the library, learn to cook in the Children's Café, or stretch their legs in the playground and garden. Downstairs at Nick's Theater—located in the Gerdin Family Lobby—patients can let their imaginations run free. The entertainment hub is named after Nicholas Gerdin, a 9-year-old Solon boy battling leukemia. His family already had deep ties to the children's hospital after parents Nicole Fountas Gerdin and Mike Gerdin and the Gerdin Family Foundation made a $12.5 million gift to help kick off the building project in 2012. But when Nick was diagnosed with cancer last April, the cause became even more personal for the Gerdins. Nick underwent chemotherapy treatment in Iowa City last year, and he eventually traveled to a hospital in Philadelphia for a promising immunotherapy trial. This past fall, the Gerdins learned Nick's cancer was in remission. Today, after undergoing a bone marrow transplant in Seattle, he's recovering and going to follow-up appointments in the new hospital his family helped build. During Nick's long hospital stays, it was the moments of normalcy and escape that provided hope—visits from his cousins, playing games with his three brothers, or watching movies with friends. So when Nicole and Mike were approached with the idea of naming the theater after Nick, it was the perfect fit. He even suggested the subtitle being used for Nick's Theater: "Where Every Child Has a Story." "For kids who are anxious about coming to the hospital, just being able to go into that lobby and seeing that warm and friendly environment will hopefully put them at ease," says Nicole, 93BA, 94MA. "It's hard being at the hospital for that long." COURTESY OF UI STEAD FAMILY CHILDREN'S HOSPITAL The 12th floor Press Box is the highest occupiable spot in Johnson County and a great place for families to watch the game. The space will also host special events like birthday and holiday parties. 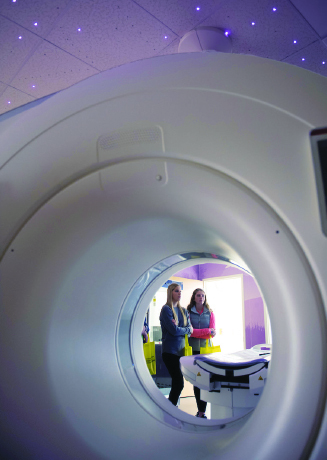 COURTESY OF TIM SCHOON/UNIVERSITY OF IOWA/OFFICE OF STRATEGIC COMMUNICATION High-speed imaging machinery reduces the need for young patients to hold their breath or require sedation, taking some anxiety out of procedures. Even the new hospital's unique architecture serves a therapeutic purpose. Early on, hospital leaders envisioned a rectangular building that would wrap around an existing parking ramp. Ultimately, architects from Foster and Partners in London sketched an oval-shaped building that's part of a long-term master plan to add two additional towers to the UIHC campus. By razing that original ramp and building an entirely new below-ground parking structure, planners were able to open up the area and allow for optimal green space and sunlight—two important components in a healing environment. Inside the tower, patient rooms ring the outside of the floors, giving each room the big picture window imagined years earlier by those young artists. "This is a big and spectacular project, and people are excited about the hope it's going to bring to kids and their families," says Scott Turner, 97MA, the hospital's executive director. "We have world-class programs already, because we have amazing people who create great bonds with patients and families. Now, we'll have a world-class building." Finally, it's all under one new roof. When attendees arrived at the fall open houses—their first glimpse inside a tower they had watched rise floor by floor—they dipped their fingers in paint and planted their thumbprints on a sign in the lobby. It read, "Our Kids. Our New Hospital." For a building with the fingerprints of patients like Drew Wall, the Denison twins, Nick Gerdin, and so many others, there was no better symbol.